Chester FC began life down in the Evo-Stik Division One North – the eighth tier of English football. New Manager Neil Young quickly set about putting a squad together, and the Blues were set for Tuesday 24th August 2010 – their return to competitive football. Rob Hopley’s early goal away at Warrington sparked jubilant scenes from the 1,200 travelling away fans; but his strike was cancelled out in the first half – and we were made to share the spoils in our opening game. A first home win against Trafford came in our third game – a 6-0 thrashing – with Michael Wilde’s hat-trick the start of his goalscoring run that saw him pick up the Golden Boot. Impressive wins followed as the Blues went unbeaten in ten league games following defeat to Chorley. Chester went on to clinch the title in April 2011 on goal difference but on 97 points, on an amazing last day that saw Chester lose at Garforth, and Skelmersdale win 7-2 at home, but Chester won the League by a margin of 2 goals, resulting in the reformed Club’s first silverware. Chester romped to their second successive title victory the following season – clinching the Evo-Stik Premier with over 100 points and 100 goals. 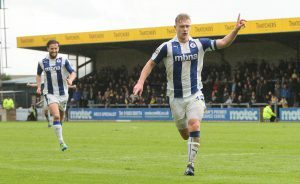 The Championship was secured with a dramatic 1-1 draw at home to nearest rivals Northwich – Matty McGinn’s stunning strike claiming the silverware in front of over 5,000 fans at the Deva. Three in a row! Chester stormed to the Blue Square North title – making it back to Non-League’s top tier in the fastest possible time. 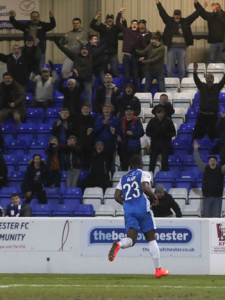 Once again, a resurgent Blues broke the 100 points and 100 goals barrier – and ensured trips to the likes of Luton, Barnet and even Wrexham for the 13-14 campaign. A narrow 1-0 win against Boston thanks to a Lewis Turner goal was enough to secure a third successive promotion. The Blues made it a double winning season – claiming the Cheshire Senior Cup with a narrow 2-1 win over Stalybridge thanks to goals from Antoni Sarcevic and Tony Gray. Another memorable season! A return to the Conference Premier was certainly a baptism of fire. 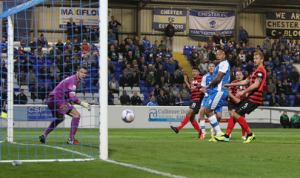 The Blues began the season with five successive defeats – before a memorable 2-0 win away at Wrexham. Not a bad way to get off the mark. However, Chester struggled to put a string of victories together and Neil Young left the club. Steve Burr was his January replacement but the Blues were dramatically relegated on the final day of the season. However, a reprieve was given to Chester to remain in the division at the expense of Hereford – who had been expelled from the league. The Blues made the most of their reprieve. Finishing 12th with a record haul of 63 points, there were plenty of memorable moments this season. Another win against Wrexham, this time at home, was made even sweeter by being in front of the BT Sport cameras – and Ben Heneghan’s 94th minute winner being a strike to savour. Steve Burr’s side also reached the FA Cup Second Round, eventually losing in a replay to Barnsley – but not before excellent away wins at Stockport and Southend. The Blues had a tricky season during the 2015-16 campaign – hitting poor form in the second half of the season with particularly poor away form. It was a run that saw Steve Burr lose his job – but his Assistant Jon McCarthy steered the side to safety on a Caretaker basis; ultimately proving to be the perfect audition when he was named as permanent Manager following the conclusion of the season. At times though, Chester hit top form in this campaign – most notably the 4-1 home win against Torquay in which top scorer Ross Hannah scored a hat-trick. Then, a stunning 8-2 home win over Aldershot in March; James Alabi helping himself to four goals in the first half. notably the 2-2 draw away at Tranmere – fighting back from two goals down thanks to Tom Shaw’s header and Ryan Astles’ incredible injury time volley. 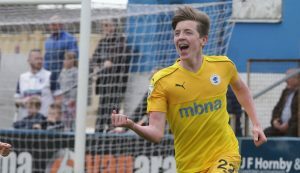 Big news was to follow when the season concluded – as Academy Graduate Sam Hughes was sold to Premier League Leicester City for an undisclosed fee. It proved to be a tough season for the Blues – as a 23rd place finish in the Vanarama National League ensured a Relegation to the North. Following the announcement of financial challenges in January 2018, Chester FC and it’s owners – the fans – showed how we can work together by fundraising and helping the club survive. The post-season period saw another Academy Graduate step up – Tom Crawford joining Notts County – and the donation of £1 million over three seasons by local businessman Stuart Murphy. Salford City’s Joint-Managers Anthony Johnson and Bernard Morley took over at the helm after guiding the Ammies to promotion.